Are you looking for a way to prevent or correct your acne scars? Dermatology, Laser & Vein Center can help! Our practice provides patients in the Montgomery, Remington, Highpoint, Sixteen Mile, Sharonville, Kenwood, Milford, Covington, and Cincinnati areas of Ohio with a number of customizable, state-of-the-art acne scar treatments. Contact us today for more information. Acne scars begin with the formation of acne. When papules, pustules, and cysts develop in the skin, they cause a break in the follicle wall of the affected pore. If this break is deep, the infected material can begin to spill into the deepest layer of the skin, referred to as the “dermis.” Once this infected material enters the dermis, it begins to destroy healthy tissue there. In order to contain this infected material and heal the follicle wall, the skin quickly begins to produce collagen fibers. While collagen is a structural protein essential for the skin’s integrity and healthy, it typically forms in uneven ways when correcting severe acne. Hypertrophic. 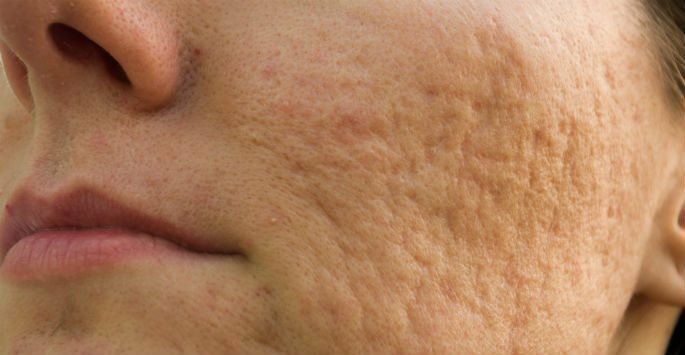 These scars are formed when an excess amount of collagen is produced in response to acne, creating a mass of raised tissue on the skin’s surface. Atrophic. These scars are formed when collagen is destroyed as the result of a deep blemish. They are usually pitted and sunken in appearance. How can I Prevent the Formation of Acne Scars? While it may sound overly simple, the key to lowering your chances of developing acne scars is to reduce the severity and frequency of your acne breakouts. Severe breakouts, particularly severe breakouts that last for an extended period of time, put you at a much higher risk of developing acne scars. The first step to controlling your acne is to schedule a consultation appointment with a board-certified dermatologist. Doctor Shalini Gupta has helped countless patients of all ages and skin types clear up their acne and get beautiful, healthy-looking skin. She’d be happy to help you, too! If you’re interested in preventing the formation of acne scars or improving their appearance, we can help. Contact Dermatology, Laser & Vein Center today to schedule a consultation appointment.